I am a self-confessed skin care junkie. I love to try new products and am always on the hunt for my next favorite. Recently I came across the prettiest face cleanser I’ve ever seen. 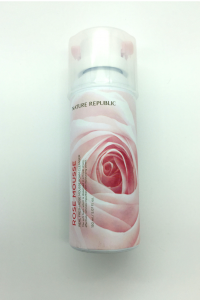 It is called Rose Mousse Foam Cleanser and it’s made by Nature Republic. Here’s the thing. I don’t have bad skin. I have never had issues. I think it’s partly genetic and partly because I have faithfully adhered to a skin care regimen since I was in junior high. I was always the girl in college that no matter how late I got home I would faithfully take off my makeup and apply all of my skin care. I remember hearing somewhere one time that every night you spend sleeping in makeup ages your face thirteen days. I have no idea where I heard that or if it’s even true, but I wasn’t about to do my own research on that to find out. 🙂 I started out with the Clinique Daily Essentials Kit (who didn’t?) 🙂 and stuck with that through college. Then I worked in retail so I was always trying whatever the ladies at the cosmetic counter were recommending. For years I’ve bought skin care off of TV shopping channels and have actually been pretty happy with it. I’ve decided that because I have been so diligent over the years, this is as good as it gets for me. 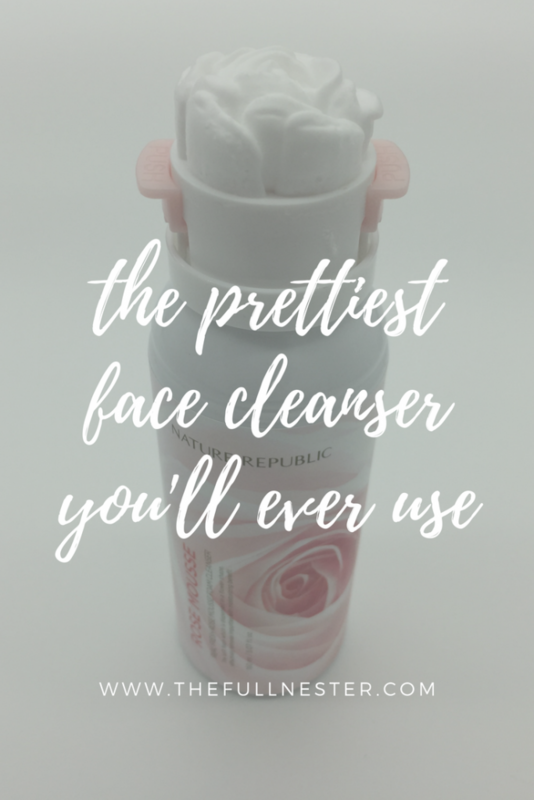 Years and years of faithful application of cleansers, toners, serums, and creams have put me in a place where I don’t really have any wrinkles. Things are just not as high up as they used to be. Gravity is winning the tussle to keep my cheekbones and jawline where they once were. 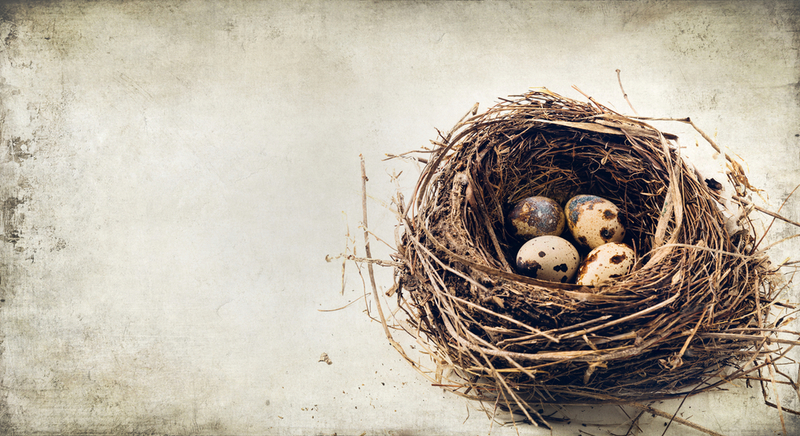 There is a softness where firmness used to be. Since I’ve resigned myself to the fact that this is as good as it gets, I’ve decided to lighten up on the whole skin care obsession and edit what I use. Last summer I read about how some French women use micellar water and thermal spring water to cleanse their faces. That’s it. I decided to try that. I don’t know if you’ve ever used micellar water before but it is really cool. You shake it up and it gets a bit foamy. You put it on a cotton ball or pad and it removes makeup really well and hydrates your face without stripping your skin. Since French women swear by micellar water and thermal spring water, I decided I should use a French brand, so I use La Roche-Posay for both products. I use micellar water to cleanse my face of makeup or after a shower. Then I apply a moisturizer and the thermal spring water spray. But sometimes a girl just needs a foamy cleanser, which brings me to the Rose Mousse. I don’t remember where I heard about it but I wanted to try it. It is sold by YesStyle and ships from Japan, so it takes a really long time to get it. I ordered it online and I think it took almost a month for me to receive it. 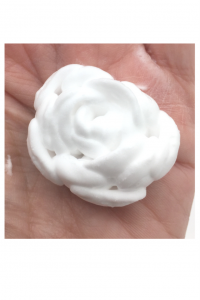 There is a similar product called 3D Rose Facial Cleansing Mousse available on Amazon that I intend to try next to see how the two compare. 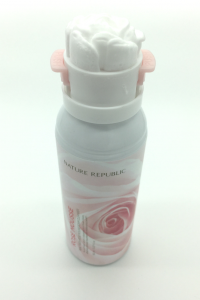 The cleanser not only smells like roses, but it also LOOKS like a rose when it comes out of the dispenser! It has the consistency of shaving cream. 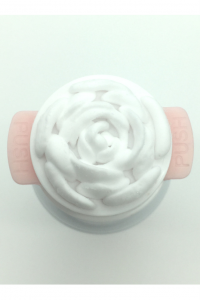 You shake the bottle then gently press on the sides of the cap, causing the foam to come out through a stencil in the shape of a rose. And it holds its shape until you massage it into your face. 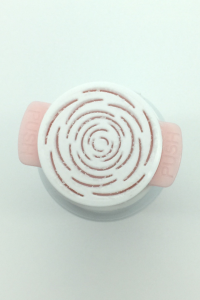 It kind of reminds of those Play-Doh extruders we used to use as kids to make Play-Doh spaghetti or hair. 🙂 The directions suggest applying it to your face for 30-60 seconds before rinsing it with warm water. It really is the prettiest face cleanser I’ve ever used. It’s lovely, and it smells really nice. Like roses for sure, but not overpowering. It leaves my skin feeling soft. 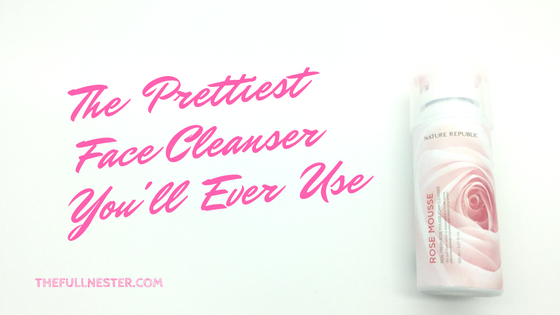 So when I’m not using plain ol’ water in the form of micellar and thermal spring water to cleanse my face, I reach for the Rose Mousse. Then I use a firming moisturizer and call it a night. I just don’t see the point of all the extra effort with all the other stuff. Sometimes I use a serum or cream I have on my vanity just because it’s there. But I’m just not a slave to all those steps anymore because I just don’t see a measurable difference whether I do or don’t.